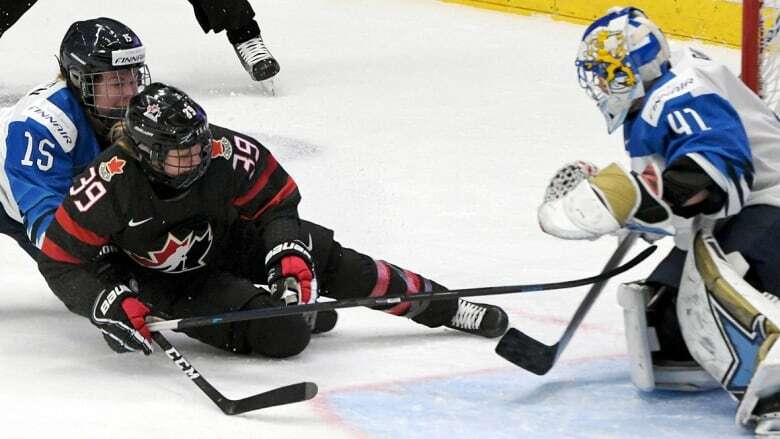 Canada won't play for gold at the women's world hockey championship for the first time in tournament history following a 4-2 semifinal loss to host Finland on Saturday. The Finns will face defending champion United States or Russia in Sunday's final. "It's unreal and on top of that, to do it here on home ice, we've been working so hard for so many years now," assistant captain Michelle Karvinen said. "It's not just one good game. "It's something we actually have earned." Canada beat Finland 6-1 to cap the group stage of this year's tournament Tuesday. But the Finns had better special teams and goaltending Saturday. 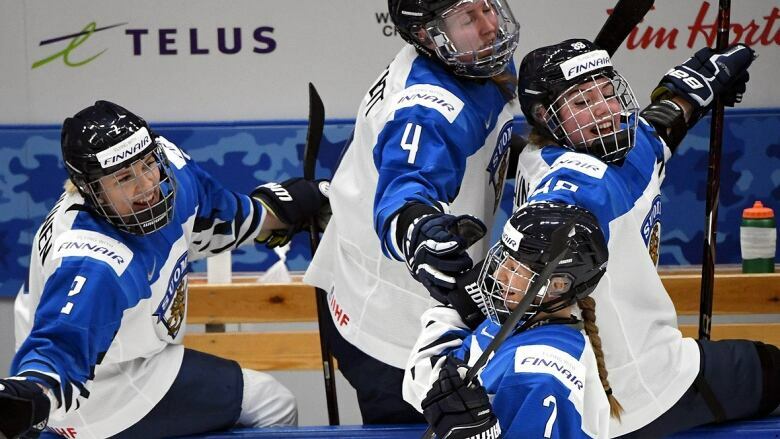 Finland's disruption of the established world order atop women's hockey will be viewed by some a good for the female game. But it was difficult for Canada to feel any positives in its loss. "It's hard to have that perspective as a player in the game," captain Brianne Jenner said. "Right now it just feels like a loss for Team Canada, which we never like to have at the world championships. "We're pretty disappointed with that outcome. We'll give credit to Finland for a game well played." Canada was without captain Marie-Philip Poulin for all but part of one period at the world championship. The highest-scoring player on Canada's roster reinjured her knee Monday attempting a return. The loss of forward Blayre Turnbull in the first period Saturday further eroded Canada's attack. She was in a vulnerable position when Savolainen pushed her and Turnbull went head-first into the boards. The player head coach Perry Pearn called "the conscience of the team," was in a vulnerable position when Savolainen pushed her and Turnbull tumbled head-first into the boards. No penalty was called. Turnbull stayed down for a minute and left the ice with assistance and didn't return. "To me, what happened there is I think embarrassing for women's hockey because checking from behind at every level is not acceptable," Pearn said. "If that was one of our players on a Finn, I would want it called. "There's a potential for someone to break a neck and for a veteran official like the group like we had, for them not to make that call is really wrong." "We've been pretty confident that one day it could happen when we play a perfect game and I have a good game," Raty said. "So we finally scored three on Canada. "That doesn't happen too often. If you keep believing in yourself, anything can happen." Canada's special teams had been effective through five games. But going 0-for-4 with a man advantage, including 90-plus seconds of a five-on-three early in the second, put it at a disadvantage. Tapani tipped a Nelli Laitinen shot between Szabados's pads at 16:18 of the second to restore Finland's one-goal lead. Gabel had pulled Canada even at 7:53 on the rush with Jenner and Ann-Sophie Bettez. It was a broken play, but Gabel got enough stick on it to tip the puck past Raty's right toe. Canada couldn't generate a goal on a two-man advantage early in the second. "A big, huge kill for us," Raty said. "If they score there, it could go either way." Canada struck early with Rattray on Raty's doorstep re-directing a Laura Stacey wrist shot at 2:32.